The DC HKD is perfect for someone who loves an aggressive approach to the jumps, ride the pipe and put some time in all over the mountain. DC stepped into the snowboard market with leather bound book and rich mahogany class. It comes in many styles and lengths but all the boards perform the same. All we can say is keep up the good work and stay classy DC! 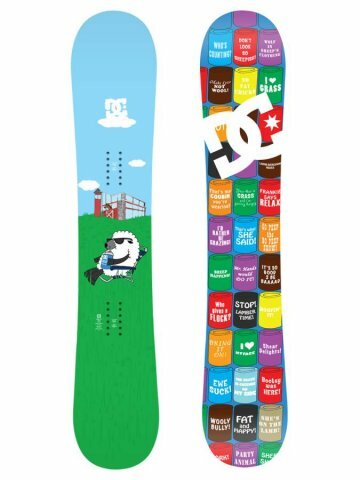 Bindings Used- Union Data’s, Union Force’s, Burton Cartel’s, Burton Co2?s with Team High Back, Flux Super Diamonds. This is one fast aggressive board. We were really surprised by it’s exceptional edge hold and speed for such a small directional twin. This is not a forgiving intermediate board. This is for people who like a very advanced and technical board that is good for going big. On Snow Feel: This is a very aggressive camber ride that can catch an edge pretty easy so it really requires you to be on your game. When you’re out of the flats this problem goes away. We detuned the tops of the effective edges before the first ride but went back again and gave it a little more filing than you normally would. After that we found this issue to be almost nonexistent. It just shows what incredibly sharp and locked in the edges are. When the groomers get chewed up it handles the inconsistent terrain very well. Its torsional stiffness allows you to really open up and make high speed turns without feeling like you are on a small narrow board. Powder: It’s surprising that our findings were similar to DC’s company line about this board. It handles better than almost any other cambered directional twin. It does very well in moderate depths and OK in the deep stuff. The nose and tail really do help you float a little better in the pow than you would think. Speed: Not much contact length means not that much board on the snow. DC has a small contact length but the board doesn’t ride small at all! Its fast base and excellent dampening really let you open up. It stays chatter free on big straight lines despite its small size (160 is the biggest). This will hang with many directional/freeride boards. It also picks up speed quickly which is great for jumps and the pipe. Uneven Terrain: It can handle soft bumpy snow but not the best on harder bumpy snow. Approximate weight– Lighter than allot of boards but is made for people with a little more weight. It was smart to give this a little more weight and engineer the top sheet for long term reliability. All and all this is a very sturdy board that sacrifices a little lightness to do so. Turn Initiation– The best way to find out how well a board turns is to take it through moguls. After a couple runs through the bumps we knew this board had good turn initiation. We found it to be not as responsive as the DC MLF and more difficult to turn. It takes a lot more effort to get this board to respond but thanks to the deep side cut it still has a tight turning radius for how stiff this board is. On groomers it can make wide carvy turns or super tight dime size turns. This is one of the board’s strong points. This board is definitely more pleasing for the advanced rider or for someone who likes a stiff board because it does take a lot of work to get this board to turn. Edge Hold: The deep side cut and extra sharp rails really cuts in to the snow and makes life stable. We would say it almost has too much edge hold. On one of the days this board was ridden there was a lot of dust on crust on most of the runs. Every time the board’s edge hit the crusty, Icy hard pack below you could feel the edge dig in and hold instead of washing out. Very well done for a directional twin. The HkD will hold its edge on that hard icy stuff you sometimes run into and climb pipe walls with ease. On hard pack or icy entries into a chute you will not have to worry about this board washing out. The bottom line is this board grips. Stiffness– Allot of boards these days can have a medium flex but ride very stiff. This is one of them. It has a medium longitudinal flex but a very stiff torsional flex and that is why we rated it above average for stiffness. It is soft and playful at the tip and tail but has a medium/stiff flex in the center. It’s a perfect combo that makes it fun as hell to ride. Switch: If you center your stance it will be hard to tell which way is switch. Very predictable to ride switch. As long as you don’t have a super wide stance you can center your stance to make it very easy riding either way. It’s not going to be like your riding a different board when you switch it up. Pipe: Edge hold and stiffness help this board climb pipe walls with ease but the forgiving tip and tail help you with the not so perfect re-entry that we all have (some more than others). This board really excels in the pipe. Jibbing– It’s not jibarific but its soft enough to screw around on occasion. This board is made for jumps and the pipe. Rails & Boxes- It’s mental to screw up this boards incredible edge hold by getting all metal on metal. Keep this board in the pipe and the jumps. Jumps: Go as big as you can. If you crash and burn it will not be because of the board. There are some boards that are more forgiving but you can have a lot of fun hitting kickers all day. Especially if you go big. We try to get as many images of the DC HKD, but forgive us if they're not all there.